Guess what happened over the weekend? Why, yes we did take Little Monkey to Urgent Care, he didn’t sleep or eat the entire weekend, and the magnetic force field in my hip must have been activated because that’s about the only place Little Monkey would stop crying.. Oh, yeah, and my 500th friend signed on to follow this insane madness! YAY! I wanna give you all a great big, warm welcome. And in celebration, let’s have a giveaway! In my Etsy shoppe I have several items that might help out with your Valentine’s Day plans. One of these items is a set of 5 Lover’s Lotto Scratch Off Cards. That’s right, just like a lottery card… Scratch off and all. Well, I am going to give one lucky follower the chance to try these out, on me. If you’d like to get your hands on a set of these, now’s your chance! Bytheway, these include several new cards, so if you’ve gotten these in the past, this is a different set. 1) Be a public follower of While He Was Napping. Leave a comment telling me you are. 2) Visit my Etsy Shoppe and leave a comment here telling me what one item you’d like and why. You must tell me why or this entry will be void. That’s it. Easy peasy, right? This giveaway will be open for seven days and will close on Sunday, January 16th at 9pm PST. Winner will be chosen through Random.org and announced on Monday, January 17th. Please be sure to leave an email address where I can contact you if you win. Winner will have 24 hours to claim the prize before a new winner will be chosen. 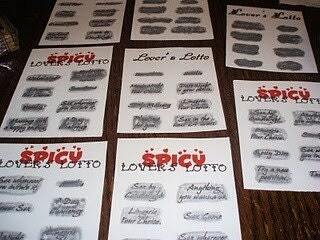 For the tutorial on this project, as well as where the original idea for a Lover’s Lotto Scratch Off Card came from, click here. An gripping word is designer note. I conceive that you should correspond much on this theme, it power not be a inhibition human but mostly group are not sufficiency to verbalize on such topics. I mixed red and silver metallic paints together with the liquid soap and it remained red! Try adding blue for a purple color. You can go over the dry paint with more straight paint or a metallic marker to make the image more opaque. It will still scratch off! I also painted the contact paper alone- let it dry then cutout lip and heart shapes that I used to cover the message. I shared this with my stamp/card club it was a big Hit! @ Meme: The way my husband and I do it is that the first one he scratches off is his “prize”. Then, he can scratch off another on the next time and pick between the newly revealed prize or the previous one. If you do a one time use thing, what they scratch off the first time is the prize. It’s a surprise. You can do it however you want to though. I hope that made sense. I love the idea and am doing a plain lucky lotto version for friends. My question do you win everything on the card? Or do they pick a favorite? These are so fun! Great valentines gift! And I became a follower – #600! Came across your blog via Today’s Creative Blog Get your Craft On and I love it! I love the Date of the Month Club because I’m not nearly creative enough to come up with such wonderful ideas myself. I love your date of the month club, because it’s so creative! And, it makes date nights so easy! My favorite iten from your shop is the “personalized & families are forever vinyl” because it is so cute, I love stuff like that & I’ve been looking for something to do with family that has our last name on it. I’m so sorry to hear your little one was so sick! 🙁 Hope he’s feeling better!! Also, congrats on 500 followers! WOW! (no big surprise though – you’ve got a great blog). My favorite item from your shop is the Peel and Stick Vinyl Bathroom Quote “Yes, you are the fairest of them all” because I am a big Disney fan and the Evil Queen from Snow White is my alter ego — just ask my kids! 😉 I would love to have that quote in my bathroom! LOL! I am already a follower of your blog. Hope your Little Monkey is doing okay. So sorry to hear you had to make a trip to Urgent Care — never fun! I love the Choose Your Own Adventure Date Night! If only there were that many ideas to do in Riverton! It just sounds like soo much fun!! Great ideas!! I am a follower!!! Love it!! My favorite thing in your shop is the Date of the Month Club. 🙂 It’s such a great idea (!) and something that both my husband and I would really enjoy doing together – I know he’d be thrilled to get it!